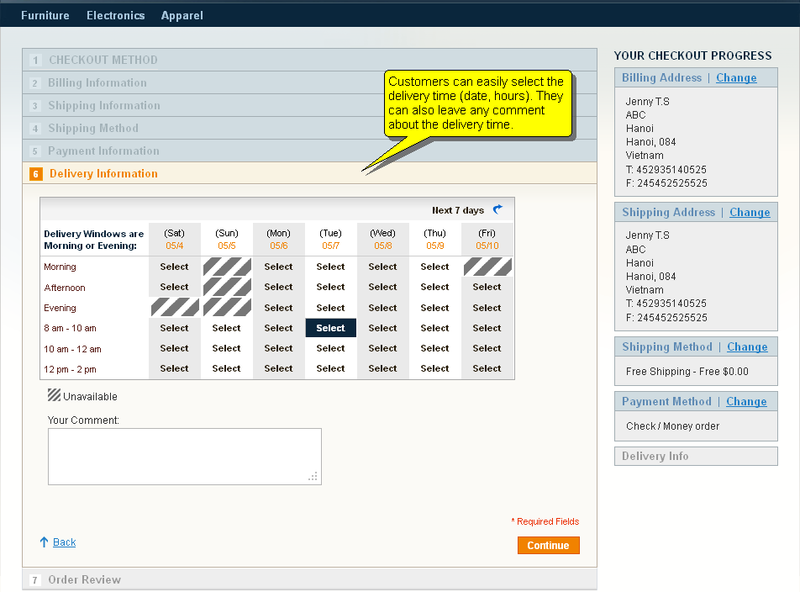 Allow customer to select the Delivery Time Slot. Allow admin to select Special Days for no deliveries. 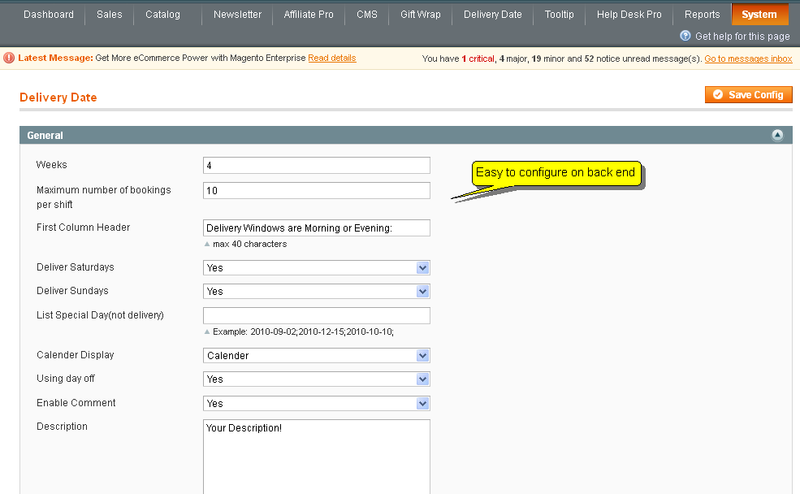 Allow admin to display "Calendar" or "Date/time Picker" in Delivery Information Step. * <Print Order> function doesn’t save delivery time information and comment. * When edit order at the backend, still be able to choose unavailable time slot. * “Datetime Picker” type is not active when payment method is Paypal Express. * <Admin/Delivery Schedule/ Using day off> is YES but at the frontend, the respective time slot is active. * Fix bug create separate slots. *Disable fields in "Manage Delivery Schedule" pages. 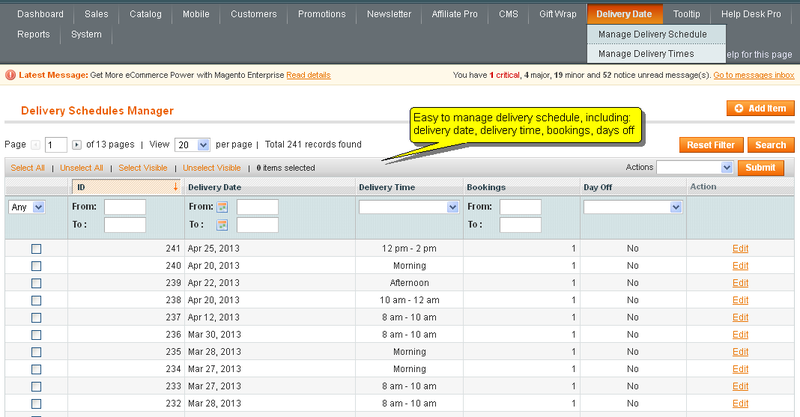 *Fixed date format in "Manage Delivery Schedule" pages. *Fixed bug in "Manage Delivery Schedule" grid. *Add translation for day of week. + Add ajax request available slots time for date time picker mode. *Fix bug "Showing Delivery Information in Invoice page "
* Fixed bug "Subtract value of Ordered attribute (-1) when order is cancelced." + Add import, export to CSV/XML to schedule and slot time page in the back-end. + Support magento professional and enterprise edition. + Add feature "Disable slot based on first slot"
* Fix bug "Error when filtering with increment_id in "Manage shedule""
This extension is extremely useful for companies to adopt a more friendly shopping experience for online customers by allowing a customised delivery time! Can be further improved by enabling/disabling for multiple shipping methods. Really one of the best plugin to have, Helpful support team. "Pros: Excellent priced, full featured extension very very flaxible and most likely what you are looking for, very good support. You need to manage your deliveries in real time, and your company is running in Magento, well, you are in luck, from googling "schedule deliveries in Magento" to purchasing and downloading you're good to go, "Advance Delivery Schedule" by Mage World is the software you are looking for. Price is only USD $89.99 (sans installation) and this is a very powerful and complete extension. In my personal experience, installation did not work for me, if you have USD $10 to spare, i'd recommend adding installation for software, If you dont, worry no more and keep reading. Alright, you have purchased this extension and downloaded it, so what's next? open readme file for further information on installation, you follow each step according to documentation but your Magento store is DEAD! Why?!?! what documentation doesn't tell you is that after uploading files to server, you need to download another package from Mage World site and upload it to your server, this package is a license activator (yes, extension requires additional licensing software to be uploaded to server in order to work properly) fine, you uoload additional licensing software to server and you are good to go! What to do next? well, let me tell you its a little tricky, some admin options are not clear and it happens to be time to perform some trial and error to learn exactly what each option does...or you can read the documentation...little did I now, there is no documentation provided with extension, this could pose a real issue to someone looking to install it and expecting to work perfectly out of the box on a live site. Site is running, you have already familiarized with most settings and corrected little css rules , site looks wonderful, but wait...whats that? Looks like there is a line in Magento's source that is keeping system timezone in UTC, unless you change that line you wont be able to have your time in sync with your extension. Alright, site is running, you have familiarized with most settings, corrected little css rules and edited line in Magento's source, now extension its looking wonderful and time is in sync with local time, customers can select a delivery time, and you can even select how many customers can select the same delivery time, times in past are set as unavailable and current day is shown in first column with available slots ready to be selected, extension works like a charm and keeps business running smoothy." We all now that in the extension world it is more likely that you will find something that should´t go they way it did: the digital world is definitely not a perfect world. My experience with the Mage-World, was beyond satisfactory since they always looked ways to not only solve the issues, but also to make sure that I was 100% happy. The extension it's easy to use and does everything that is suppose to do. No need to say that I will definitely recommend to give it a try. You have nothing to loose: when you need them they will be there! This extension is very powerful and feature-rich, but the technical support surpassed all my expectations. Thank you Mage World team for your rapid response in helping me configure this to work with another Magento extension. As my online business grows, I will no doubt be purchasing again from here very soon. We run a local shop and wanted to extend our reach by going online. The problem is Magento seems to be focussed on purely online store setups and thats where Advance Delivery Schedule came to the rescue. We now have an online store with extremely granular control over when we will deliver our orders. This extension is really awesome. Bought this extension yesterday and with the help of customer support, was able to install it and it runs smoothly with no problems. Awesome UI, easy to use, and provides everything we need to schedule delivery times and dates. The support was great. I got a few things to fix and they helped me to fix it. Thanks MageWorld. i purchased this addon and it conflicted with another extension(from another company) on my site. I asked MageWorld for help and they fixed it completely. This is what i call GREAT support ! Extension does exactly what i want.. as i personally deliver stuff to customers in my town, this extension was a must. DELIVERY SCHEDULE in admin panel. user can select day in 4 week next from current time. Maximum number of Bookings per shift: Allow to define maximum number of Bookings per shift.